In2net Network Review 2019: Is In2net Network a Good Hosting? 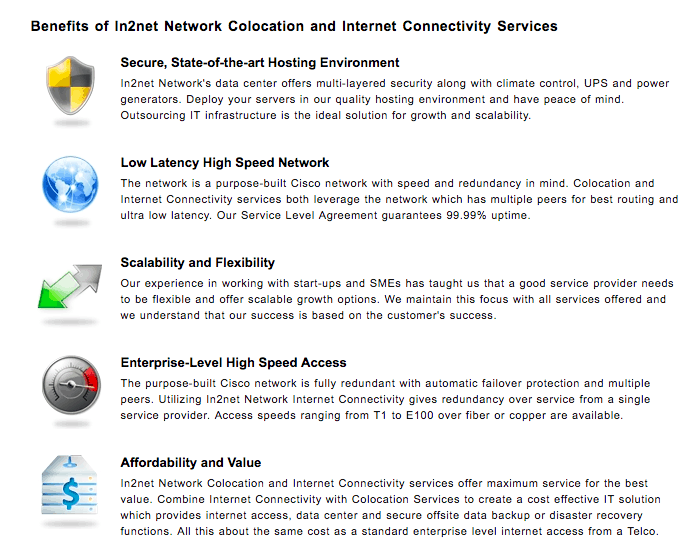 In2net Network is a long standing Canadian company selling enterprise level services. The main benefits of using In2net Network include a solid uptime service level agreement and robust Vancouver-based data centers, however, additional value add-ons are limited. In2net Network began life in 1996 as a dial-up and data center service provider. In 1999, it switched focus to become a data center provider. Now, it owns and operates a data center in British Columbia, Canada, selling colocation and dedicated server rental to small and medium sized businesses. The website is available in English. In2net Network only sells enterprise level services, and not shared hosting (although you can purchase this from DollarHost, which is linked to from In2net Network). The climate controlled data center is located twenty minutes from Vancouver, and all of the power systems have fault tolerance at every layer, as well as multiple fiber optic uplink paths for full network redundancy. In the event of an outage, the backup system will be activated within seconds. It’s nice to see an actual uptime service level agreement with 99.99% uptime. Every hour of downtime in excess of the guarantee will result in one day of prorated credit to the customer’s account. Just be sure to note, you need to request the credit, otherwise it is not applicable. In terms of the dedicated server plans, they come with FTP and full root access to install any program, DNS management, and email services. You can choose between a Windows or Linux operating system when you purchase a dedicated server plan. Unlike many dedicated server companies, there are limited customization possibilities; you simply choose one of the three server plans. Sadly, I was left underwhelmed by the options. The prices are high with a small setup cost, and I am not sure the resources or features justify the premium price point. That said, if you’re a Canadian business needing to have a Vancouver-based data center, this could be your one of your only options (plus Canada is an expensive country). Plans are paid for monthly only and you cannot pay for the services online. Although I find that frustrating, it is oftentimes the case with dedicated servers companies. There is a 30-day money-back guarantee, as well. You can contact the company by email (to various departments) or telephone. However, I was quite surprised to see that the company only commits to responding within three business days. It’s good to know that there’s a decent knowledge base on the website for your perusal whilst you’re waiting! This company is so well established since it started out back in the day of dial-up internet services. Perhaps not outstanding in every area, this company does provide a solid data center, with an excellent uptime service level agreement. Wondering how In2net Network stacks up against other Web Hosting companies? Enter any other Web Hosting company and we will give you a side-by-side comparison.